Floreal glass wrapped in brass. 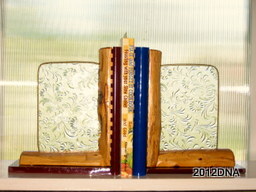 Bookend bases with the help of Christian Lapp, made from re-purposed materials. Glass Removal/Interchangeable.